Synonyms and Other Names: mackinaw, siscowet. Native Range: Widely distributed from northern Canada and Alaska (missing in southern prairie provinces) south to New England and Great Lakes basin (Page and Burr 1991). In northwestern Montana, Lake Trout are native in Waterton Lake, Glenns Lake, Cosley Lake, and St. Mary Lake. (Snyder and Oswald 2005). In southwestern Montana, glacial relict populations of Lake Trout exist in Elk Lake and Twin Lake (Vincent 1963, Brown 1971, Synder and Oswald 2005). Table 1. States with nonindigenous occurrences, the earliest and latest observations in each state, and the tally and names of HUCs with observations†. Names and dates are hyperlinked to their relevant specimen records. The list of references for all nonindigenous occurrences of Salvelinus namaycush are found here. 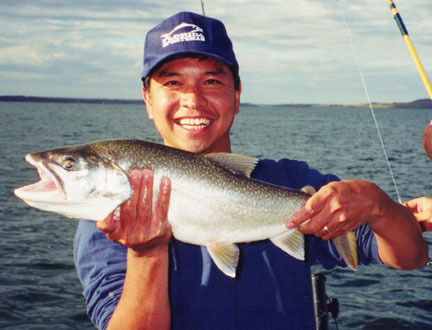 Means of Introduction: Lake Trout have been intentionally stocked as a sport fish. In the Great Lakes, the species was stocked to restore populations within its native range that had been decimated by the sea lamprey. Kaeding et al. (1996) summarized what is known about the illegal introduction into Yellowstone Lake. Status: Reported as established locally in California, Colorado, Idaho, Massachusetts, North Dakota, South Dakota, Washington, and Wyoming. Extirpated in Connecticut (Whitworth 1996). Scientists have concluded Lake Trout are established in Yellowstone Lake and are present at such high numbers eradication is probably not possible (Kaeding et al. 1996). Impact of Introduction: Lake Trout often lead to the demise of other trout species where it is introduced. For instance, introductions into Lake Tahoe led to the elimination of the native Lahontan cutthroat Oncorhynchus clarkii henshawi (McAffee 1966; Moyle 1976; Behnke, personal communication). Cordone and Frantz (1966) reported a drastic decline and eventual extinction of native cutthroat in Lake Tahoe after the introduction of Lake Trout. Lahontan cutthroat were abundant in the lake in 1907, with only an occasional Lake Trout reported. By 1938, the cutthroat has virtually disappeared, and by 1966, Lake Trout comprised 70% of angler catch in the lake (Cordone and Frantz 1966). Stocked Lake Trout have replaced native cutthroats in deep Rocky Mountain lakes (Benson et al. 1961). This trout has also virtually eliminated cutthroat and bull trout in Flathead Lake, Montana, and Pend Orielle Lake, Idaho. The introduction into Yellowstone Lake poses a similar threat to the native Yellowstone cutthroat trout O. c. bouvieri. The introduction of Lake Trout led to the extirpation of three of the four populations of Sunapee trout (Behnke, personal communication). Lake Trout introduced into Flaming Gorge Reservoir were found to prey heavily on the Utah chub Gila atraria (Teuscher and Luecke 1996). Predation by Lake Trout was shown to be a major factor in the decline of kokanee O. nerka in Lake Chelan, Washington (Schoen et al. 2012). Competition with and predation by nonnative species (i.e., Catostomus sp., creek chub Semotilus atromaculatus, redside shiner Richardsonius balteatus, burbot Lota lota, brown trout Salmo trutta, and Lake Trout Salvelinus namaycush) limit populations of the rare bluehead sucker Catostomus discobolus (Wyoming Game and Fish Department 2010). Remarks: A recent illegal introduction in Yellowstone Lake, Wyoming, has been of great concern there. Biologists are worried about effects on native Yellowstone cutthroat trout (McCullen 1994; Anonymous 1994; Kaeding et al. 1996). A plan has been devised by the U.S. Fish and Wildlife Service to remove the Lake Trout from Yellowstone Lake but scientists are skeptical that eradication efforts will succeed. Although it is found in some surrounding states, the Lake Trout has not been stocked in Oklahoma (Pigg, personal communication). Ng et al. (2016) used life history data and population models to evaluate different different management scenarios, finding that a slight (2x) increase in mortality applied over 20 years could cause population eradication. Anonymous. 1994. Nature: something's fishy in Yellowstone. Newsweek 29 August 1994. Beckman, W.C. 1952. Guide to the fishes of Colorado. Colorado Department of Game and Fish. Benson, N.G., J.R. Greeley, M.I. Huish, and J.H. Kuehn. 1961. Status of management of natural lakes. Transactions of American Fishery Society 90:218-224. Breukelman, J. 1946. A review of Kansas ichthyology. Transactions of the Kansas Academy of Science 49:51-70. Burr, B.M., and L.M. Page. 1986. Zoogeography of the fishes of the lower Ohio-upper Mississippi basin. 287-324 in C.H. Hocutt and E.O. Wiley, eds. The zoogeography of North American freshwater fishes. John Wiley and Sons, New York, NY. Burr, B.M., and M.L. Warren, Jr. 1986. A distributional atlas of Kentucky fishes. Kentucky Nature Preserves Commission Scientific and Technical series Number 4. Cardoza, J.E., G.S. Jones, T.W. French, and D.B. Halliwell. 1993. Exotic and translocated vertebrates of Massachusetts. Fauna of Massachusetts Series 6. Massachusetts Division of Fisheries and Wildlife, Westborough, MA. Chapman, W.M. 1942. Alien fishes in the waters of the Pacific Northwest. California Fish and Game 28(1):9-15. Cordone, A.J., and T.C. Frantz. 1966. The Lake Tahoe sport fishery. California Fish and Game 52(4):240-274. Cox, B.S., A.M. Dux, M.C. Quist, and C.S. Guy. 2012. Use of a seismic air gun to reduce survival of nonnative lake trout embryos: a tool for conservation? North American Journal of Fisheries Management 32(2):292-298. Cross, F.B. 1967. Handbook of fishes of Kansas. State Biological Survey and University of Kansas Museum of Natural History Miscellaneous Publication 45, Topeka, KS. Dunham, J.B., D.S. Pilliod, and M.K. Young. 2004. Assessing the consequences of nonnative trout in headwater ecosystems in western North America. Fisheries 29(6):18-24. Harlan, J.R., E.B. Speaker, and J. Mayhew. 1987. Iowa fish and fishing. Iowa Department of Natural Resources. Hartel, K.E., D.B. Halliwell, and A.E. Launer. 2002. Inland fishes of Massachusetts. Massachusetts Audubon Society, Lincoln, MA. 328 pp. Hendricks, M.L., J.R. Stauffer, Jr., C.H. Hocutt, and C.R. Gilbert. 1979. A preliminary checklist of the fishes of the Youghiogheny River. Chicago Academy of Sciences 203:1-15. Hoover, E.E. 1936. Prelimary biological survey of some New Hampshire lakes. Survey Report 1. State of New Hampshire Fish and Game Department, Concord, NH. Hubbs, C.L., and K.F. Lagler. 1947. Fishes of the Great Lakes region. Cranbrook Institute of Science Bulletin 26. Bloomfield Hills, Michigan. Jones, D.J. 1963. A history of Nebraska's fishery resources. Nebraska Game, Forestation and Parks Commission. Kaeding, L.R., G.D. Boltz, and D.G. Carty. 1996. Lake trout discovered in Yellowstone Lake threaten native cutthroat trout. Fisheries 21(3): 16-20. McAffee, W.R. 1966. Lahontan cutthroat trout. Pages 225-231 in Calhoun, A, ed. Inland fisheries management. California Department of Fish and Game. Sacramento, CA. McCullen, K. 1994. Alien trout puzzle Yellowstone biologists. Rocky Mountain News (Sept. 22, 1994) 8A. Raasch, M.S. and V.L. Altemus, Sr. 1991. Delaware's freshwater and brackish water fishes - a popular account. Delaware State College for the Study of Del-Mar-Va Habitats and the Society of Natural History of Delaware. Schoen, E.R., D.A. Beauchamp, and N.C. Overman. 2012. Quantifying latent impacts of an introduced piscivore: pulsed predatory inertia of lake trout and decline of kokanee. Transactions of the American Fisheries Society 141:1191-1206. Smith, P.W. 1979. The fishes of Illinois. University of Illinois Press Urbana, IL. Stiles, E.W. 1978. Vertebrates of New Jersey. Edmund W Stiles Somerset, NJ. Syslo, J.M., C.S. Guy, and B.S. Cox. 2013. Comparison of harvest scenarios for the cost-effective suppression of Lake Trout in Swan Lake, Montana. North American Journal of Fisheries Management 33(6):1079-1090. http://dx.doi.org/10.1080/02755947.2013.824935. Vincent, R.E. 1963. The native range of lake trout, Salvelinus namaycush, in Montana. Copeia. 1963(1): 188-189. Webster, D.A. 1942. The life histories of some Connecticut fishes. 122-227 in A fishery survey of important Connecticut lakes. State Geological and Natural History Survey of Connecticut, Department of Environmental Protection, Hartford, CT.
Wiley, R.W. 2003. Planting trout in Wyoming high-elevation wilderness waters. Fisheries 28(1):22-27. Wiltzius, W.J. 1985. Fish culture and stocking in Colorado, 1872-1978. Division Report 12, Colorado Division of Wildlife.